The world is a mysterious and magical place. As such, it totally makes sense that unicorn cakes would exist in this miraculous place we call Planet Earth. A unicorn cake is exactly what it sounds like – an ode to the sparkly-maned, glitter-horned, mythological creature containing massive amounts of processed sugar. A quick look on Instagram reveals a plethora of gorgeous-times unicorn cakes that seriously give us all the #bakinggoals. But don’t worry. As fancy and complicated as these unicorn cakes look, they’re actually fairly easy-peasy to assemble. No, seriously, we promise you don’t have to be the best baker in the world to make an awesome-looking unicorn cake. So don’t let the fear of being a Pinterest fail stop you from attempting to make one of these magical desserts! 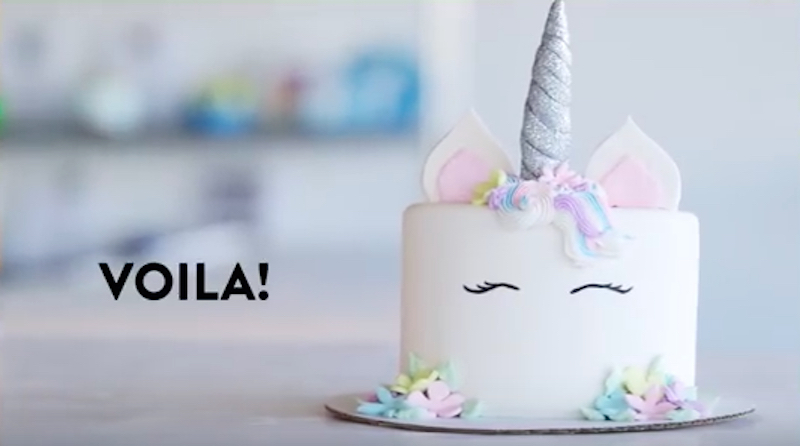 Pop Sugar made a badass how-to video that makes the art of unicorn cake-making look, well, like a piece of cake! And here are all the steps broken down to make it even easier. Then come the adorable little unicorn ears! Um, make that adorable little GLITTERY unicorn ears! Let’s get that horn nice and glittery, too. Now it’s time to have some fun with fondant. And now it’s assembly time! Oh, also, you get to draw on the eyes, extra lashes if you please! Now for the pretty, pretty mane!